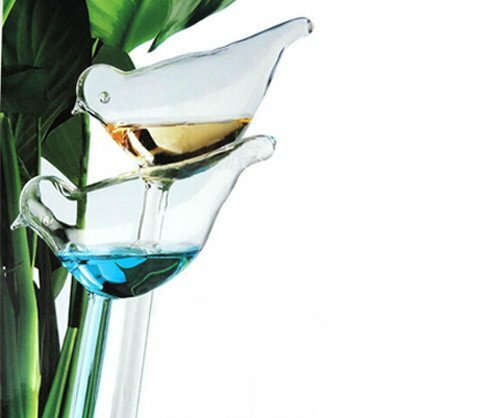 DOYOLLA Set of 2 House Plant Self Watering With Best Hand Blown Glass Bird Waterer System Is Easy As Aqua Globes. Automatic Globe Irrigation For Patio, Lawn, Garden Pot Or Planter. Glass bird waterers, with Self-watering system. If you are filled with water and insert in the vase, usually continuous water about a week and just convenient for you. Of course, it's not only perfect for hard to reach plants, but also decorative Birds hold water. And believe that it will be a great gift to send to your dear friends and family. Patio, Lawn & Garden accessories would not be complete without the easy to use glass birds. Includes Premium Packaging, well protected for shipping and ready for gift giving on any occasion. Forget about watering cans; Create automatic drip irrigation system with our best plant waterer. Lawn & Garden watering equipment can be too large for patio or house plants -the birds are perfect. If you have any questions about this product by DOYOLLA, contact us by completing and submitting the form below. If you are looking for a specif part number, please include it with your message.